So, something for everyone… mostly. The iZen aroma diffuser lamp was a seemingly unlikely find on the website of Hifi-tower who are specialists in record players, DJ equipment and nice stereo systems. However, they also have a section for more unusual household items it’s impossible to live without such as shoe polishers and desk-top fridges. 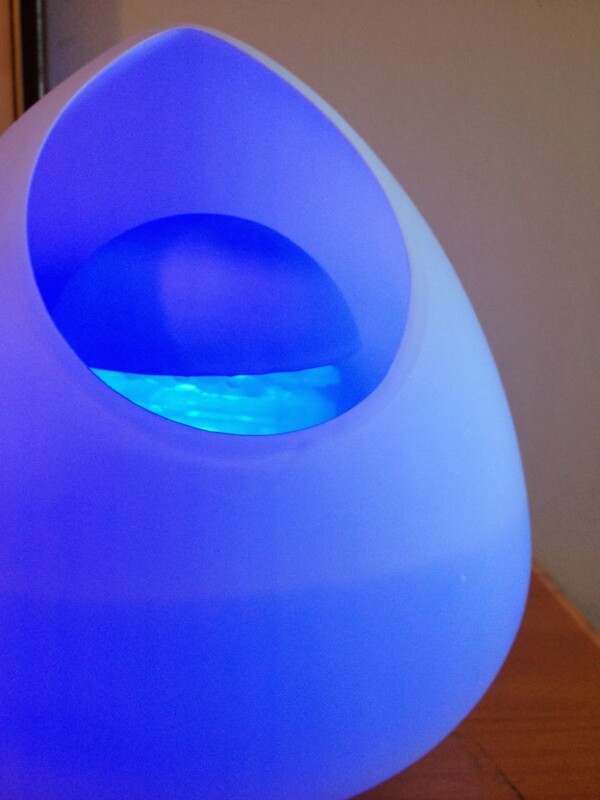 The thing I chose has colour changing LED light and system the produces a fine mist which – if you’ve put scented oils into the thing – smells nice. It’s a beautiful shape and trickles away quite happily all day – I have it by my desk in the hope that the right combination of essential oils will unleash my inner genius. As Christmas draws nearer I’ll put it by tree with a suitably festive scent. Hifi Tower‘s customer service is also pretty good as the first diffuser didn’t work, but the replaced it very quickly with one that does. 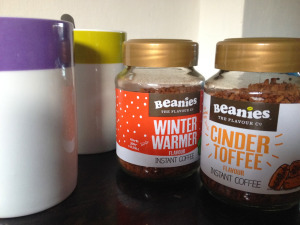 Beanies flavoured coffee is much nicer than I expected it to be. There, I said it. I am a bit of a coffee snob and don’t normally have instant coffee at home. I was tempted by the range of flavours it comes in including Christmas pudding, mulled spice, Irish cream, winter warmer and cinder toffee. I was sent a jar of winter warmer and one of cinder toffee to have a try. The winter warmer is delicious but I can’t quite put my finger on what it tastes of. Except it’s exactly the same as some flavoured coffee I had on a visit to Washington state in 1992. I think then it claimed to be vanilla. Equally the cinder toffee manages to be redolent of toffee without being sweet, which is quite an achievement when you consider toffee is mostly sugar. Boy One who has suddenly developed a taste for coffee – particularly the frothy designer stuff from Starbucks and the like – claims it’s “flipping lovely”. It would make a nice after festive dinner coffee too. Too many cups might become sickly, but it makes a welcome change. The coffee is available on line or from Sainsbury’s. Hotter Energise shoes for the Panther. 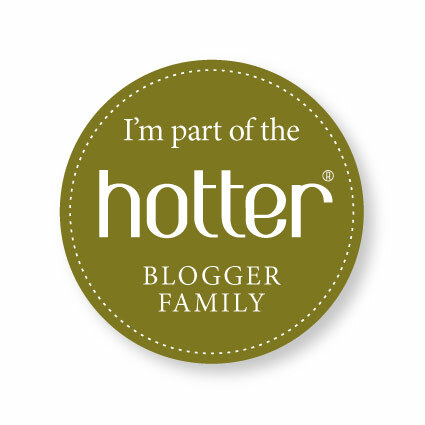 I’ve been a fan of Hotter shoes and a member of their ‘blogger family‘ for a while now, but the Panther, who affectionately calls me Imelda, has shown little interest. He’s very pleased, however, with his new shoes and says “they’re really comfy, proper comfy”. Clearly as well as nice footwear, he has a way with words. 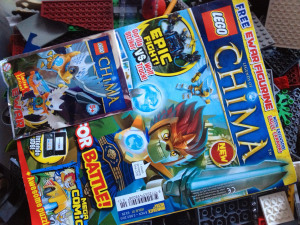 Lego Legends of Chima Magazine. I may have mentioned it before, but this family is largely built on Lego. All three Boys are huge fans and there’s often a scuffle for a certain piece or other Lego-y trinket. So a new Lego magazine has been pounced on by all three. I was sent all these items to review.